Without Scott realizing it, we (by we, I mean me) were on a mission to find one of Guerlain's latest releases at Sephora Milan. 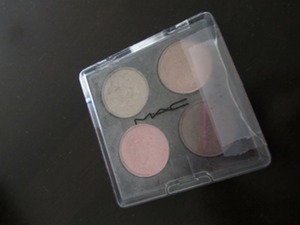 The combination of colours reminded me a lot of an eyeshadow quad I personally created a few years ago at MAC in Las Vegas. However, with time and lots of travelling, the plastic case has not fared well and should probably be tossed in the trash. My prayers have been answered with this purchase. My fingers were greeted with a velvety smooth experience held within this golden vessel. The shadows are soft to the touch and gravitated towards my brush with ease. Application is a cinch, due to Guerlain's unpronounceable high calibre contents. Colour intensity is easy to obtain - a few strokes of the brush and you're finished. Les Perles also comes with a how to guide, which shares three separate looks; illuminate and open, accentuate contrast to create structure and a smoky look to create mystery and depth. Is it just me or does anyone else think CoverGirl's Tapestry Taupe eyeshadow could serve as an awesome dupe for the medium colour? Ultimately, I had really hard time choosing which one of the quads I wanted to add to my collection; Guerlain presently offers 9 different palettes. With my MAC container looking as sad as it does now, #08 les perles reigned supreme. Guerlains' Palettes sell for $59.00US/$95.00AUS. Girls, Guerlain isn't just for your Nana's anymore.